Are you in the mood for food? St. Patrick’s Day is right around the corner and we’d like to share some fun recipes to get you into the spirit (green clothing not required)! 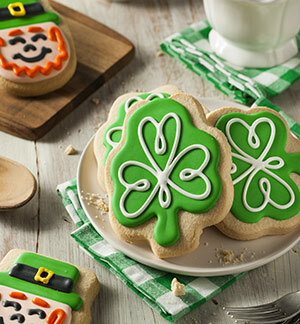 These recipes are great for a party or simply for a fun St. Patrick’s Day dinner for your family. Preheat oven to 300 degrees F (150 degrees C). Rinse the beef completely and pat dry. Place the brisket on rack in a roasting pan or Dutch oven. Rub the brown sugar on the corned beef to coat entire beef, including the bottom. Pour the bottle of stout beer around, and gently over the beef to wet the sugar. Cover, and place in preheated oven. Bake for 2 1/2 hours. Allow to rest 5 minutes before slicing. In a medium bowl, beat the butter and cream cheese together until smooth. Add the vanilla and confectioners’ sugar; beat until smooth. Using your hands if necessary, mix in the coconut. Roll into balls or potato shapes, and roll in the cinnamon. Place onto a cookie sheet and chill to set. If desired, roll potatoes in cinnamon again for darker color. All recipes courtesy of AllRecipes.com. Are you Irish? Do you celebrate St. Patrick’s Day? Which recipes will you try? Share with us if you decide to make something and how it turns out! Homemade face mask recipes to get your skin going from drab to fab!